Superb property located in the natural park of Cala d'Hort, enjoying absolute peace and spectacular views over the sea and the island of Es Vedra. Room, Ground level, direct access to the pool, direct access to the terrace. This bedroom has 1 double bed 180 cm. Bathroom outside the room, private, With shower. Room, Ground level, direct access to the terrace, view of the sea. This bedroom has 1 double bed 160 cm. Bathroom ensuite, private, With shower. This bedroom includes also office area. Room, 2nd floor, view of the sea, in another building. This bedroom has 1 double bed 180 cm four poster bed. Bathroom outside the room, private, With shower. This bedroom includes also private balcony. Suite, Ground level, in another building. This bedroom has 1 double bed 180 cm. Bathroom outside the room, private, With shower. Suite, 1st floor, view of the sea, in another building. This bedroom has 1 double bed 180 cm. Bathroom outside the room, private, With shower. 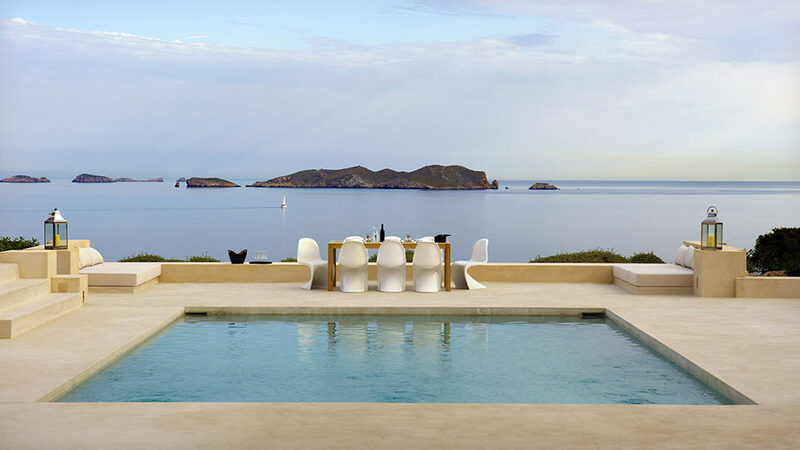 Panoramic views of the sea and Es Vedra! This charming and comfortable villa is just 5 minutes away by car from the beaches of Cala Carbó, Cala d'Hort and Cala Vadella. Private access road (for 2 houses). San José is 7km and Ibiza city is 30km away. Villanovo is a wonderful company wcho I trust fully, everything was perfect and communication was amazing, so important!! Thank you so so much, I'll be booking again.